from The House in the Night © Beth Krommes, 2008, used with permission. Beth Krommes was born and raised just over the hill in Emmaus, PA. She recalls applying to study art at Kutztown State College. Her portfolio was accepted, but she chose to go to Syracuse University, in part, because it was further from home and she longed to travel. After her undergrad painting degree there, she earned her Masters from U Mass, Amherst. She got to travel abroad when she studied for a year at St. Martin’s School of Art, London. She and her husband have raised two daughters in New Hampshire. Today she works full-time as a children’s book illustrator out of her home studio. It the past she has worked at a wide variety of jobs, including that vanishing occupation “public school art teacher.” She was a secretary, an art director for a computer magazine, and has even worked in retail as the manager of a fine handcraft shop. Beth Krommes visited Kutztown this weekend for the KU Children’s Literature Conference. She gave three presentations, including one for local school children and one for the university community. 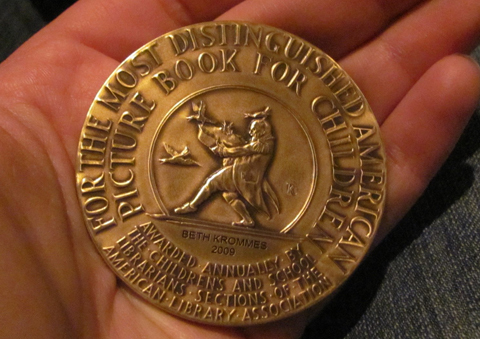 She then thrilled conference attendees, mostly teachers and librarians, when she passed around her actual 2009 Caldecott Medal. Named for the great Randolph Caldecott, the medal is awarded annually to the finest picture book illustrator. At least one local librarian was moved to tears to hold the Beth’s medal in her hands. Beth Krommes is master of several media, including wood engraving. It is a very detailed, labor intensive way of making pictures. Wood engraving is one on the oldest forms of reproducing art. Today the medium is having something of a renaissance. Wood engraving is the refined cousin of woodblock printing. Engraving needs to be done on the end grain of the wood. Actually, Beth explains the process quite well at her website, www.bethkrommes.com. Below is a sample her wood engraving. You can see and purchase individual limited edition prints here. 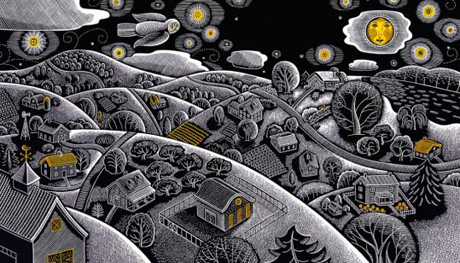 Since wood engraving is so time-consuming and unforgiving, her recent illustration work is done on scratchboard. Scratchboard has a similar look to wood engraving since it, too, is a subtractive way of making a high contrast illustration. 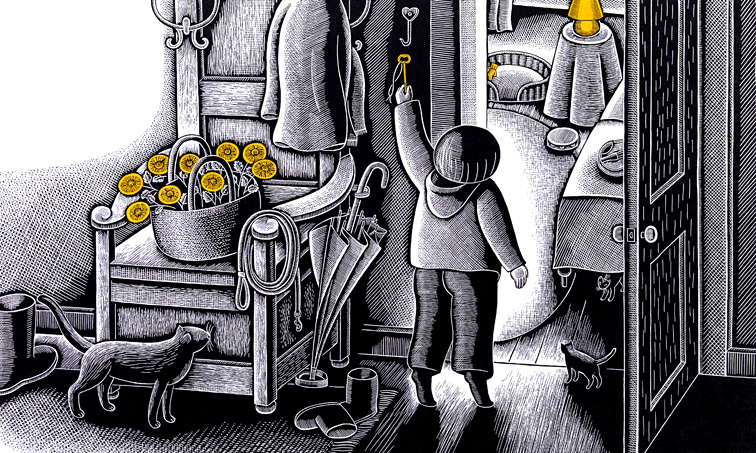 If you want to learn more, a visit to her website will reward you with more information about her scratchboard technique, and a link to her moving Caldecott speech. 1. Join the Society of Children’s Book Writers and Illustrators (the SCBWI). This professional organization is dedicated to those who write, illustrate, or share an interest in children’s literature. There are more than 22,000 members worldwide. 2. Read The Complete Idiot’s Guide to Publishing Children’s Books by Harold D. Underdown. Of the many available books on this subject, this is my favorite. 3. Read Writing With Pictures — How to Write and Illustrate Children’s Books by Uri Shulevitz. I especially like the chapters on designing a book. 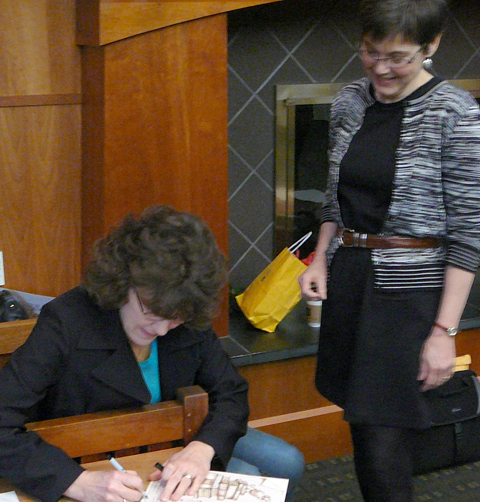 Above is a picture of KU CD student Cheryl Sheeler signing a copy of her illustrated KU Lit conference poster for Beth Krommes. As Cheryl would say, How cool is that? Amazing enough, Beth Krommes wasn’t the only Caldecott winning illustrator on campus last week. Next week I will write something about our other distinguished visitor, Jerry Pinkney. What beautiful, beautiful work. Had I been there to hold the medal, it’s likely I would have cried, as well. 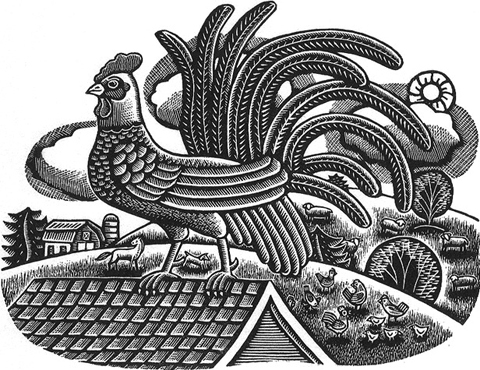 B&W woodcuts, lino-prints, scratchboard, all of those types of illustrations have had a very strong appeal to me since childhood. Thank you for sharing Ms. Krommes beautiful work! Thanks for commenting, thanks for reading.